Günter Köle and Stefan Pfanner examining a prototype of a microreactor made at Anton Paar. The pharmaceutical industry consistently reports high company revenues. This is due to highly valuable products called APIs (active pharmaceutical ingredients) that extend our lives and result in high turnover for the pharmaceutical companies. APIs are either produced biotechnologically using huge fermenters with thousands of liters in volume or made by organic synthesis. “In order to speed up these costly processes and increase the safety (for example, to avoid the risk of an explosion that is often connected to organic synthesis), researchers and manufacturers started considering continuous technologies in small reactors with small volumes and a high throughput,” says Günter Köle, head of the department for Analytical and Synthetic Chemistry at Anton Paar. Within the research project “CC Flow” and together with pharmaceutical companies like Janssen, Patheon, Astra Zeneca, and Lonza, the specialists at Anton Paar have printed such a microreactor. 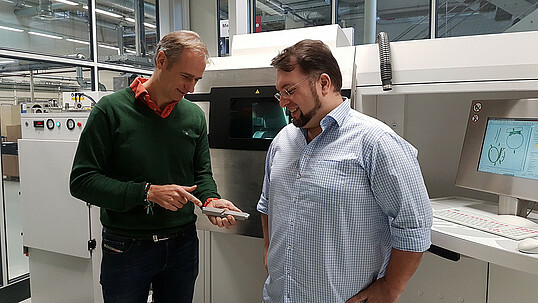 “We developed just three prototypes until we knew the final design and the perfect internal and external dimensions,” explains Stefan Pfanner, specialist for additive manufacturing and direct metal laser sintering at the Austrian technology company. The technology was used to produce the microreactor following the research and simulation by Prof. Oliver Kappe and his team from the University of Graz. The reactor itself is made from stainless steel (316L powder), is just a little bit smaller than an A5/B5 sheet (exactly 164 mm x 93 mm), and about 3 cm thick. It consists of a serpentine cooling core surrounded by the reaction channels with an inner diameter of 0.8 mm and a total length of four meters, with four inlets, two defined reaction zones, and one outlet. This reactor was exactly designed for one synthesis: the difluoromethylation of a lithiated nitrile with fluoroform as a major component. Fluoroform is a known greenhouse gas and a byproduct of the synthesis of Teflon (known from coatings and high-performance fibers like Gore-Tex). “Stainless steel was the ideal material considering the required chemical, mechanical, and thermal stability, and the thermal conductivity that was needed for this kind of organic reaction,” explains Stefan Pfanner. The reactor design allows the conversion of a batch reaction into a scalable, fast, and continuous process. “By connecting several microreactors, the product yield can easily be multiplied,” reports Günter Köle, who plans to develop various tailor-made reactor types for different industrial requirements. 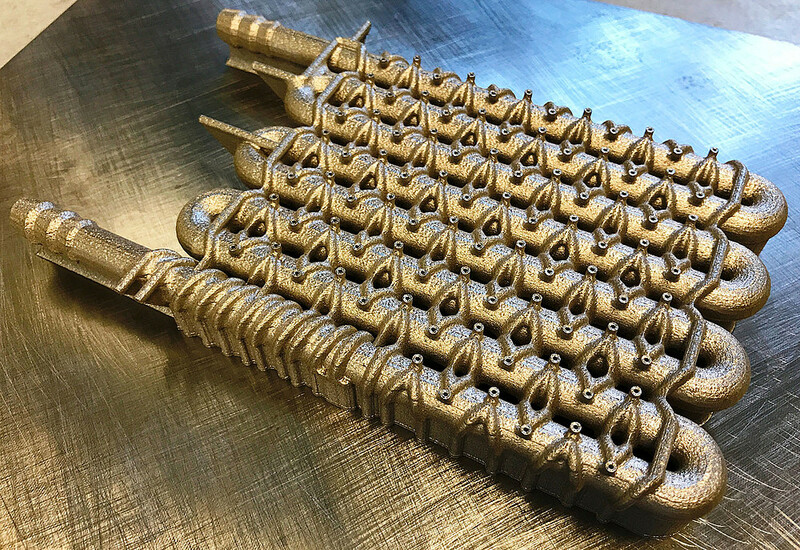 It is likely that additive and digital manufacturing technologies, in combination with computational simulation, will play a fundamental role in designing the next-generation, continuous flow microreactor systems. Since the project has recently been published by the Royal Society of Chemistry, industrial interest has already popped up. A flow reactor for the difluoromethylation of a lithiated nitrile with fluoroform as a major component. The reactor was printed using direct metal laser sintering.